The looming cold weather will hinder the fight to control the overpopulation of feral cats in Toronto, experts say. 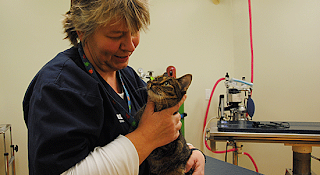 The Toronto Animal Services shelter at 821 Progress Ave. opened a free spay/neuter clinic in August 2010, which operates about six days a month. Eletta Purdy, Toronto Animal Services manager, says the clinic will run until mid November and is slated to re-open in January, while they’ re-evaluating their trap-neuter-return (TNR) strategy, in which feral cats are sterilized so that they can’t produce offspring and then returned to their colonies. Feral cat caretakers have to register their colony on the Toronto Feral Cat Project’s website and take TNR training sessions to be eligible to go to the Toronto Animal Services’ free clinic, St. Germain said. The Toronto Feral Cat Project works closely with the Toronto Humane Society, which held an event Oct. 16 for Nation Feral Cat Day with workshops to teach people about TNR. “It’s really important that everybody works as a community,” St. Germain said. “You need people, you need organizations, local communities, districts, and the city to be involved – it’s a right-across-the-board project.” She says there are workshops as well as support groups. “And we have a support group that [people] can join and it’s really beneficial because it’s very stressful to take care of a colony of cats,” St. Germain said. “You have to be there every day. It’s financially stressful, it’s a time constraint, emotionally very hard on a lot of the people who take care of these cat colonies, because cats are just vulnerable and they get killed and they get hurt and they get sick.” St. Germain says the organization has a Toronto feral cat survey and they’re asking people to register colonies on their website, which is kept confidential, as they’re trying to find out how many cat colonies exist in Toronto. She says it’s also a way to back up their claims when they ask for funding from the government. The Toronto Feral Cat Project will be ongoing indefinitely, while the organization is in the process of deciding whether it’s going to become a charitable organization or non-profit group, St. Germain said.